We would love to take a look at your roof and then advise you what we can do with our professional roof restoration services at a price you will be delighted with. Inspection: We do a full inspection to assess what action is necessary. Replace: All broken tiles will be replaced during as part of our roof repairs, checking water courses and ensuring your roof is waterproof. Cleaning: When we perform a roof restoration, we undertake a high pressure clean using water pressure at 4000psi, this will remove all dirt, pollution, moss etc. Valley Irons: During roof repairs and replacements we also remove old rusty valley iron and replace it. Re bedding: We will remove all the old cement bedding (mortar) blow clean the surface and layout the new cement bedding. Repointing: All of the ridge, hip, gable and valley tiles will be re pointed. The pointing compound is flexible and will not crack as it is specially formulated to adhere to the ridge tiles. Gutters: Our team will clean your gutters and remove all leaves, dirt, rubble and debris. Paint: Our professional roof restoration services offer our Melbourne clients a Dulux 4 coat system. 10. Spare tiles: It is always wise to have some spare tiles, we will leave you with 6 painted spare tiles on site. 11. Thanks to our roof restoration services you now have the best looking roof in the street. Worksafe Victoria - Due to safety requirements safety/guard rails will be temporarily erected around the perimeter of your home for all roof repairs and installation services. The rails will be erected prior to work commencing and taken down on completion. It is against the law to undertake any work at heights without the Worksafe approved fall protection. Guarantee: At Roof Quotes we are a Dulux accredited applicator, so you will receive a written 10 year guarantee from Dulux. Our professional staff members use Dulux Acra Tex. With years of experience in the roof restoration and replacement industry and after trying all other painting products we believe Dulux is the best. It is also the only product that comes with a 10 year guarantee from the manufacturer. 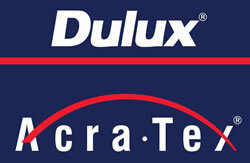 Dulux Acra Tex is a heavy duty coating which is up to three times thicker than conventional paint. For the best roof restoration in Melbourne, come to us!